Yesterday, Dropout Nation reported on the American Federation of Teachers’ latest LM-2 financial disclosure to the U.S. Department of Labor, and how it spent $29 million in 2013-2014 to preserve its declining influence. But as your editor noted back in July and in a Rare column that ran last week, the nation’s second-largest teachers’ union is spending plenty to expand beyond serving elementary and secondary school teachers. This can be seen in its spending this time around. In Washington State, the AFT spent $504,759 on helping its affiliate organize teachers working in early childhood education programs. The work in the Evergreen State is one part of the union’s effort to become the dominant agent for teachers working in prekindergarten programs that are now the darling of both Republican and Democrat politicians. Altogether, the union has spent $709,647 since 2009-2010 in the state.. This includes teaming up with the Service Employees International Union in Seattle to launch a ballot initiative that would require childcare centers contracting with the city to pay a $15 minimum hourly wage to its workers — or $1.05 more than the average hourly wage currently earned by preschool teachers there. Altogether, the union has spent $709,647 since 2009-2010 in the state. Another place where the AFT is looking to organize early ed teachers in New Mexico. The union directly spent $279,809 on the preschool teacher organizing project headed up by its Land of Enchantment affiliate. Altogether, the AFT has spent $1 million in New Mexico since 2010, making the state the biggest play for the AFT’s efforts. Meanwhile in Florida, the AFT spent $50,686 to bring early childhood education teachers into its fold. The AFT is also spending big on organizing efforts — as well as opposing reform — throughout the nation. One of the AFT’s key states for organizing is Louisiana, where the successful school reform efforts in New Orleans after Hurricane Katrina nine years ago have challenged traditionalist thinking. The union spent $432,393 last fiscal year on the joint organizing project it put together with United Teachers New Orleans, its Crescent City local. It also poured $40,542 into an organizing project in nearby Jefferson Parish as well as subsidized its local there to the tune of $20,237; the union also poured $8,338 into an organizing project in Caddo Parish, the final payoff for a successful effort to HB 609, a bill that would have allowed Louisiana to create new school districts, including one in Caddo Parish that would have allowed some families to escape the low-performing traditional district. The AFT put $29,247 into an organizing project in East Baton Rouge as well. Meanwhile the AFT subsidized the efforts of its Louisiana affiliate to the tune of $532,825 in 2013-2014; it also spent $6,406 in advertising with the publisher of Louisiana Weekly as part of the union’s Reclaim the Promise initiative. Expect the AFT to pour even more money into Louisiana in 2015 as both the Bayou State’s elections and the 10th anniversary of Hurricane Katrina will give the union opportunities to attack efforts to expand choice and other reforms. Then there’s the Midwestern states. Take Michigan, where the AFT and the NEA are both looking to end the tenure of Gov. Rick Snyder, who successfully passed a series of measures that have weakened the ability of the two unions to force districts into collective bargaining. The AFT poured $774,910 into its Wolverine State affiliate, and another $130,905 into its so-called solidarity fund. There’s also Wisconsin, whose governor, Scott Walker, is being targeted by the AFT and other public-sector unions for successfully abolishing collective bargaining and forced dues collections. The union poured $73,854 into Recommit Wisconsin, and put $56,539 into the coffers of its Wisconsin Federation of Nurses & Health Professionals unit to expand the ranks of nurses now in the national union’s fold as well as to take on Walker. As for the Wisconsin affiliate (which is now merging with the NEA’s Badger State affiliate after losing 63 percent of its members) since 2011? The AFT put $50,364 into its solidarity fund and another $20,240 into its political action committee. The AFT also tossed $5,000 to progressive group One Wisconsin Now, which is also targeting Walker along with other Republicans who have supported weakening teachers’ union influence. Then there is Ohio, where Gov. John Kasich, coasting into a re-election victory, is likely to push another effort to abolish collective bargaining and other reforms that will weaken the AFT and other public-sector unions. The AFT put $215,301 into its Buckeye State affiliate’s organizing project, tossed $66,565 in subsidies to the unit itself, and put $127,512 into its solidarity fund. The union also put $48,008 into political funds for two locals. Altogether, with the $19,505 spent on its Midwest project, and $384,250 into one focused on the Great Lakes region, the AFT has poured $2 million into organizing and fighting against reform in key Midwestern states. Then there’s Chicago, where AFT President Randi Weingarten has already promised that the union will back Karen Lewis, the bellicose boss of its Chicago Teachers Union local, to the tune of $1 million if she decides to run against incumbent Mayor Rahm Emanuel. The AFT has put $205,444 into CTU itself, while pouring $130,000 into political action committee of its Cook County College unit. The AFT also donated $60,000 to the Kenwood Oakland Community Organization, a community grassroots outfit that is advocating for the end of mayoral control of the Second City’s traditional district. Expect the AFT to spend even more in Chicago just to knock of Emanuel if Lewis decides to run. The AFT also put $2.7 million into its Northeast Organizing Project. It also gave $50,000 to the Newark Teachers Union, its local in the New Jersey city as part of its “Locals in crisis” effort. The crisis, in this case, was to beat back reformers in the city at the ballot box, and the money was well spent; the local teamed up with others in the city to elect failed school principal Ras Baraka as Newark’s mayor over the reform-minded Shavar Jeffries. The AFT gave $38,015 to the Boston Teachers Union’s political action committee, which then helped elect union boss-turned-state representative Marty Walsh over reformer John Connolly last year. 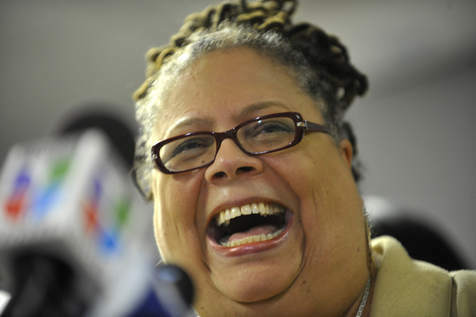 The AFT is putting plenty of money behind Chicago local boss Karen Lewis’ efforts to end systemic reform in that city. It will likely even back her possible campaign to become Second City mayor. Of course, the AFT’s efforts in New York State are among its most-important. The union poured $14 million into New York State United Teachers, the Empire State affiliate it largely controls (with the acquiescence of the National Education Association), as well as into its political action committee. This is a 17 percent increase over the subsidies the AFT poured into the unit in 2012-2013. With Weingarten and Michael Mulgrew, the head of the AFT’s Big Apple local, the United Federation of Teachers, having asserted control over NYSUT earlier this year through the ouster of Richard Ianuzzi as its president, expect NYSUT to toe national’s line when told. Meanwhile the AFT also focused on Colorado, a state where reformers have some chance of gaining traction thanks to the floundering campaign of Democrats including Gov. John Hickenlooper (who will likely be repaid for his failures to aggressively advance reform by losing a run for a second term). There, the AFT poured $25,433 into the Colorado Organizing Project, while giving $95,347 to its state affiliate. The union also put $100,000 into Colorado Commits to Kids, which unsuccessfully pushed to pass Amendment 66, which would have increased income taxes (from 4.63 percent to as much as 5.9 percent for earners making more than $75,000 a year) for additional school funding. The AFT also gave $6,050 to Colorado WINS, the public-sector union consortium which succeeded in winning wage increases of as much as 4.4 percent for rank-and-file members. Looking to weigh in on local races, the AFT gave $160,000 to Committee for Better Schools Now, an outfit which supported teachers’ union-friendly candidates in Douglas County, Colo., whose reform-oriented board majority has made waves by opening negotiations with unions to the public as well as voucherizing school funding. The group only succeeded in electing one of its four candidates for the district’s board, failing to beat back reformers. Given that Weingarten has declared this week that the union will spend even more on political campaigns this election cycle, the spending on organizing and reform-opposing is no surprising at all. But it does take money — and the AFT spends a lot of it. The union generated $345 million in 2013-2014, a 7.5 percent increase over the previous fiscal year. This is the first time in a few years that the AFT has seen revenue increase. Forced dues collections in the form of a per-capita tax on members at the local level was $169 million, a 17 percent increase over the previous year. Increases in dues payments are one likely reason for the growth in dues flowing into the union’s coffers. The other is the AFT’s aggressive effort to expand its membership, especially beyond education. Some 70,624 associate members were among the AFT’s rank-and-file, a 33 percent increase over 2012-2013; unlike traditional rank-and-file members, who first pay to their locals, and then to state and national, associate members pay directly to the union’s coffers to its benefit. The union also counted 331,260 retired teachers in its ranks in 2013-2014, a three percent increase over the previous year. The growth in the last group proves to be particularly beneficial politically for the Progressive and Unity caucuses, the two coalitions who have long controlled the AFT’s leadership because retirees are longtime members of both groups. As for the rest of the membership: The AFT’s counts 713,320 full-time members, a slight decline over the 714,525 full-timers in the rank-and-file last year. As a result of the decline, along with the growth among retirees, associate members, and those outside of education, full-time teachers in the rank-and-file account for just 45 percent of the union’s 1.6 million members, a one percent decline over the previous years. Meanwhile the AFT’s addiction to heavy borrowing to tide it over continues. The union borrowed $112 million in 2013-2014 through its line of credit with SunTrust; all of it was repaid. Over the past three years, the AFT has borrowed $317 million to finance its operations. Without the borrowing, the AFT generated $233 million in 2013-2014, a 14 percent increase over the previous year. Meanwhile the union’s obligations to retired staffers remained unchanged at $31 million. You can check out the AFT’s latest financial disclosure yourself by checking out the HTML and PDF versions of the AFT’s latest financial report, or by visiting the Department of Labor’s Web site.